BioExplorers' detection system owes its exceptional level of performance to the optimal integration of natural sensors perfected by nature over millions of years, with present-day advanced technological capabilities. To illustrate the superiority of natural senses over man-made sensors, one may consider face recognition: the capabilities of artificial systems are by far inferior to what we humans do effortlessly – recognize a face in a crowd within seconds. Speech recognition is another good example, where despite investments of billions of dollars in research and development, the performance of technological systems lags far behind human capabilities. For many years, canines have been considered the 'gold standard' of explosives and narcotics detection. 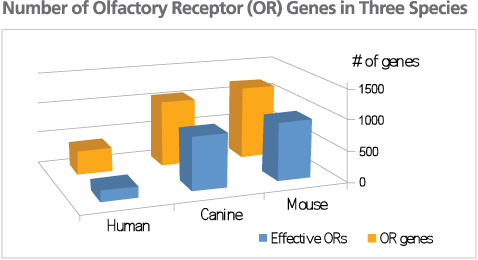 However, BioExplorers' team of experts in biology and zoology has identified mice, which have been endowed with more olfactory receptor genes than canines, as the ultimate biosensor. The olfactory skills of mice, which are the primary sense they rely upon when foraging for food, mating and avoiding predators, have been honed to perfection. Their high specificity enables them to accurately and reliably detect an almost endless variety of substances, with a near zero false alarm rate. Mice achieve near perfect detection rates even when only vapors of the target substances are present, at ppt (parts per trillion) concentration levels. Furthermore, while canines benefit from excellent olfactory capabilities, their duty cycle is short, and they require regular motivation building measures in order to continue performing at their best. In contrast, BioExplorers' biosensors use their olfactory senses to detect odors constantly, as part of their routine existence; these are not skills they are called upon by trainers or handlers to summon when given a command, for a specific period of time. Please contact Tamar Group and Bio-Explorers directly or through authorized partners, distributors or agents only.